Today's blog is the start of an ongoing experiment with what makes my favourite white loaf. In my book, there is nothing nicer than a warm, crusty white loaf slathered in butter with a good piece of cheese on the side. And although I have a good basic white bread recipe of my own, I wanted to understand more about the nuances of loaf making and what I can do to get a crustier, slightly darker bake without losing the lovely soft inside. This is something I'd been wondering for a while ever since I regularly got into baking bread a year or so ago. When I weaned my daughter, I discovered baby-led weaning which is basically the slummy mummy's way of feeding your child. You give them finger sized bits of food to chew on. None of this nonsense of pureeing mountains of orange-coloured veggies, only to end up wearing half of it. 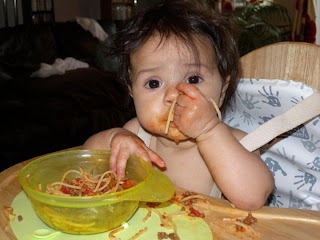 In fact, my daughter's first official dinner was spaghetti bolognese (unpureed) and she loved it. With bread being such a staple, I was disappointed to find that shop bought bread has so much salt in it and of course bread from a real bakers (not that we have one here in the back end of beyond) doesn't come with nutritional information so I figured the only way to monitor her salt intake from bread was to make my own. Reading up on the subject, even St Delia (of whom - shock horror - I am not a fan) has resigned herself to the fact that you need some salt in bread to give it flavour and it affects the rising action of the yeast. Different bakers will tell you to put different amounts of salt per 500g of flour - the most shocking I found was in a Paul Hollywood Cheese and Onion Loaf that required 15g of salt on top of the salt already coming from the cheese. I reduced that one to 10g and it was still to salty for me. Dan Lepard has written about the subject of salt in bread and the need for taste vs the need to reduce salt in our diet. He ends by saying "Use salt respectfully" Sound advice. Anyhow, with the help of my Prospero, I had the basic white loaf down to an art form in a few attempts. To make this even easier, you can do the first rise in the fridge overnight. This is my recipe, the blog for today continues below. Put the dry ingredients into a bowl and stir to combine. Either mix in a freestanding mixer with a dough hook for 5 minutes or mix by hand and knead for 10 minutes. Leave to rise for 1 hour in a warm place. But for me, the crust was never quite crusty enough or dark enough. I've been wondering why this is because I gave this same recipe to my mum and she (sometimes) gets that lovely slightly dark crust to the top. Was it our different ovens? I know she uses her Kenwood to mix so it wasn't necessarily woman vs machine. She does prefer Canadian bread flour. I tried that. It didn't really make any difference. And then I got my copy of Short and Sweet. And the preface to the first set of recipes discusses what to add to your loaf and what difference it makes. Do you use water or milk? Butter or oil? Sugar or not? Should you use steam in your oven (or will it blow up!)? So many variations, all to make a simple white loaf! So I decided just to follow Dan's easy white bread recipe, see what the outcome was and tinker from there. Boy, I'd forgotten what a faff hand baking can be when you're trying to do it around a toddler who clings to your legs plaintively wailing 'Abbbeeeeeeeeee MIX!' It's my own fault for teaching her to cook at such a young age. As soon as she could sit up, I'd let her sit on the work surface and watch her bread being made so a year on from that she thinks that she should be involved in anything I cook. Both a joy and a curse when there are hot things about. The first mix reminded me of Lorraine Pascale's bread making mantra 'the wetter, the better'. I guess because I normally use the prospero to knead my bread, I don't get involved in the wet and sticky stages. Although Lepard says bread doesn't need too much kneading, this little fella had to be mixed then kneaded three times at ten minute intervals before a 45 minute rise, before shaping and another 45 minute rise before cooking. By the end of it, I wasn't sure that it really was an easy white loaf. In fact it was just a tiny blob of dough (most of it was stuck to my hands despite me oiling them) that didn't have the big rise I'm used to with my usual loaf. When I removed it from the oven, the crust seemed so hard that I was worried I'd over-baked it - I still don't have the measure of my new oven just yet. Temptation got the better of me. Before the poor thing had even had a chance to think about cooling, I'd whipped out my bread knife and carved off a chunk. Slathered it in butter. Result. Hot, chewy insides with a perfect crust. Still being slightly in doubt of the result, I cut a second piece under the auspices of testing out the lemon curd I made the other day. I'd read that home made curds only keep for a couple of weeks due to the egg content which makes them start to separate. 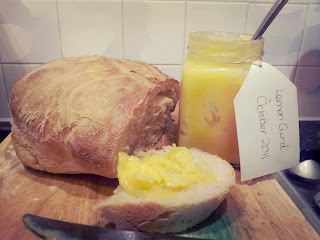 But I can vouch for the fact that Nigel Slaters lemon curd is still good some three weeks after opening and even better on Dan Lepard's easy white bread. Was it really easy? Well maybe I need to rebrand my own loaf the 'Lazy White Loaf' and then yes, this was pretty easy. Next step to try tinkering with it. I'm sure there'll be another blog about it soon. Put the flour, yeast and salt in a bowl, pour in the warm water and stir everything together into a sticky shaggy mass. Scrape the dough from your hands, cover the bowl with a cloth and leave for 10 minutes. Lightly oil a 30cm area of the work surface and your hands, and knead the dough lightly for 10 seconds, repeating twice more at 10-minute intervals. Return the dough to the bowl and leave it for 45 minutes. Wipe the work surface, dust it with flour then pat the dough into an oval. 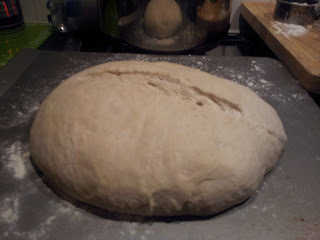 Roll it up tightly, give each end a pinch to keep it neat then place the dough seam-side down on a floured tray, cover with a cloth and leave until the dough has increased in size by a half – about 45 minutes. Heat the oven to 220°C/200°C fan/425°F/gas 7. Flour the top of the dough, cut a slash down the middle and bake for 35-40 minutes.